Hola! These little babies have been rocking my world the last few days and I think you might love them too! When my hubby is away, I tend to make bigger meals so that I can just have the leftovers lying around in the fridge for a lazy dinner or lunch the next day. 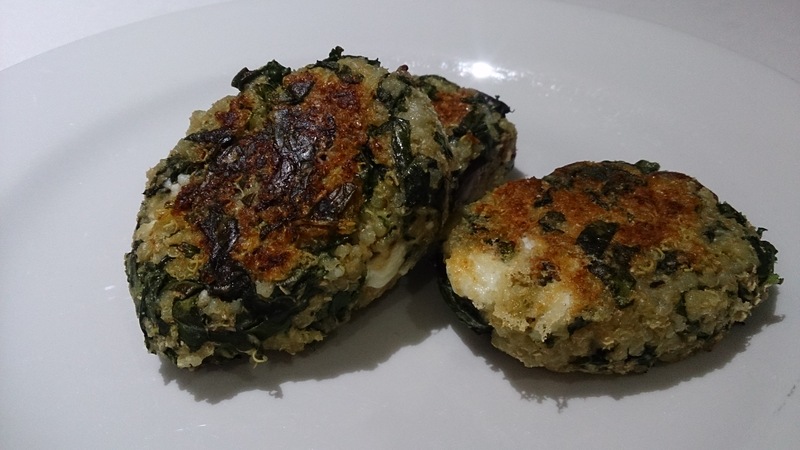 This week I made a big pot of vegetable and lentil soup using some awesome purple carrots that came in my organic veg box, as well as these quinoa cakes. I had these with some oven roasted salmon for dinner, then kept the leftovers and have had them as a light lunch (with salad) or just as a snack on the run over the next few days. They are equally delicious hot or cold! You can play around with the “fillings” once you have the method down pat, they really are super easy AND nutritious! Place the rinsed quinoa and the water into a medium saucepan and bring to the boil. Turn down to a gentle simmer and cook covered for 10 mins. Place the silverbeet in, just in a layer on top of the quinoa (which is now almost cooked) and put the lid back on. Turn the heat off and leave to steam for a further 5-8 mins. Allow to cool for a few minutes before adding the quinoa and silverbeet to a large mixing bowl. Throw in the other ingredients – mint, fetta, olives, flour, salt and pepper and combine. We are looking for a consistency that is “gluggy” enough to make into patties, so you may need to add more flour if it is too wet or an egg (or some water) if it is too dry. Heat the oil in a large non stick frying pan on medium heat. Add the patties and cook on either side until golden brown, this should only take a few minutes on either side. Serve with some natural yoghurt, hot or cold, anytime of day for super deliciousness! A great side dish for a steak/chicken/fish or simply on their own. Hope y’all enjoy this one. This entry was tagged fetta, iron, leftovers, olive, organicvegetables, protein, quinoa, quinoacakes, seasonal, silverbeet, spinach. Bookmark the permalink.